Steven is currently working full time with TSA as a pilot for United Airlines. 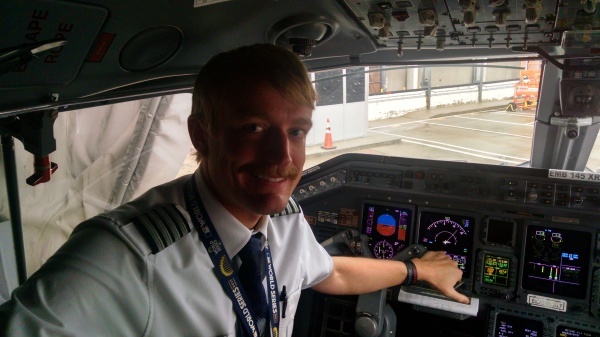 In November 2017 he was upgraded from First officer (right seat) to Captain (left seat) He passed all his upgrade training on the Embrarer 145 aircraft. He currently has his own place in Colorado but is based for now out of Washington/Dulles. Which means most of his flights originate out of IAD. Until his transfer goes through to be based out of Denver he will continue to live in Colorado Springs and commute to work. Steven still owns his poultry business, Three S Farm. However, since flying is very demanding of his schedule his sister, Stephanie is now running and maintaing the business. If you want to know more about the poultry business you can go to his website www.ThreeSFarm.com. When Steven isn't busy running PRICOM or in the air navigating through the clouds, He is at his apartment in Colorado either writing music on his keyboard, paying bills or playing games with his two roomates. He also enjoys going home to hang out playing the piano or goofing off with his siblings. A new fun sport he enjoys with his brothers, Isaac and Kevin is , "airsofting." He loves spending time with his family and the performing arts such as the theatre and symphony. Or just hanging out watching movies. When Steven comes to visit each of the siblings have an individually unique bond with, "Big" brother. He always manages to spend time with each one. Steven does this sacrificially without any complaining, grumbling or arguing. Steven is a great listener. He will always be the glue around here that keeps things together. A lot of times Steven is just available to listen and help sort things out. When he is finished with all his hard work and play he still takes time to relax by playing the piano or the violin.